According to Deuteronomy 25, if your relative died with no heir, the nearest male kinsman was to marry her and provide an heir for the dead. This was done so that his name not be blotted out of Israel. Sounds like a good plan. But what if you didn’t want to marry her? Let’s read the rest of the law in Deuteronomy 25:7-10. Ruth and Boaz lived long after this law was written. 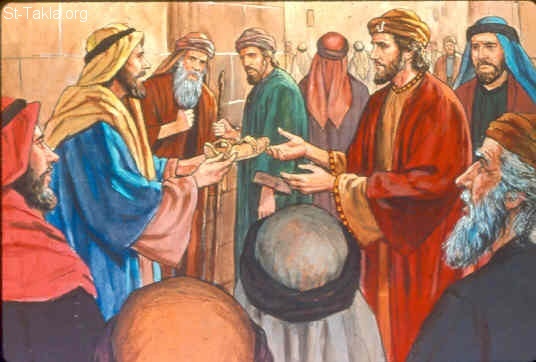 Boaz performed the first part by meeting at the city gates with the nearer kinsman. He explained the conditions of buying the land that belonged to Elimelech and that it included marrying Ruth, the Moabitess. The man declined to buy back the land because he didn’t want to marry the woman. So far so good. As you can see, the spitting part is no longer there nor is Ruth, the widow of the dead, present at the transaction. All the elders and the people gathered at the gates were witness to the whole transaction. Boaz had enumerated in the hearing of all everything he had acquired, leaving no doubt as to what and who now belonged to him. In the same way Jesus, the greater Boaz, went to bat for us against the devil. He defeated him with his own weapon, death, completely plundered him, and got all the spoils, which includes us! Remember what God said to the serpent way back in the garden? “And I will put enmity Between you and the woman, And between your seed and her Seed; He shall bruise your head, And you shall bruise His heel.” Jesus crushed his head but his heel was bruised in the process. Tell me: To what part of the body does the heel belong? THE FOOT. Jesus walked all over the devil demonstrating His right of ownership! And who benefits? Us, Church: The Ruths! His bride! Since Jesus fulfilled ALL the Law, IT CAN NO LONGER WALK ALL OVER US! Their prayer for Boaz was that the LORD, YHVH, the covenant-keeping One, bless the woman, who is coming to his house and make her like Rachel and Leah, two of the most prestigious women in Israel, builders of the house of Israel. They wished him prosperity and every blessing! Notice they also respected Ruth? They did not call her, “That Moabite woman,” but honored her for the virtuous woman they all knew she was.